In this Danielle Miller Jewelry interview, Danielle Miller reveals her inspiration and techniques used to create modern jewelry that embodies both art and play. She wants the wearer to not only adorn themselves, but to interact with the jewelry. Danielle Miller graduated with a Bachelor's of Fine Art from the Tyler School of Art at Temple University, specializing in jewelry and metals. After college, she worked under the guidance of a master goldsmith and also started creating her own jewelry. By 1998, she was able to start her own jewelry business. She now designs jewelry full-time from her studio in South Carolina. Danielle Miller knew since the age of five that she wanted to be an artist. She made sure that dream came true. LoveToKnow (LTK): When did you first start designing jewelry? Danielle Miller (DM): I truly discovered my passion for working with metals while at a high school summer art program where I was introduced to large scale steel sculpture and braze welding. I entered art college with the notion that my studies would be concentrated in sculpture but found my true calling in an elective jewelry/metals class. I viewed jewelry/metalsmithing as small-scale sculpture. LTK: How did growing up in a steel mill town influence your jewelry design? DM: I have always been drawn to geometry, minimalism, and mechanisms. I believe that growing up in a steel mill town played a huge role in influencing this design aesthetic. I took in the everyday sights like factory architecture, railroad tracks, and the lattice of bridges, with a child's wonder-filled eyes. Like the gears and rails that inspired it, my jewelry is geometric with a slightly mechanical quality, and much of it has moving parts. LTK: You also describe your body of work as "jewelry with kinetic elements designed to attract and engage the attention of the wearer." 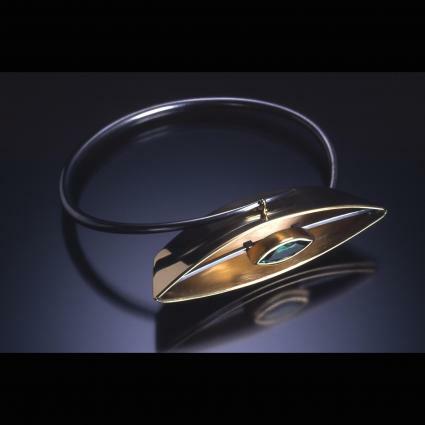 How do you use kinetic elements in your designs, and in what ways does it engage the wearer? DM: I integrate simple mechanics into my jewelry designs to create movement. Hinges, rivets, pivots, and propellers allow pearls and stones to freely slide, spin, swing, or rock rhythmically. These elements usually require an action by the wearer for motion - it can be a gesture, turn, or a deliberate "flick" of the movable part. As a result, these articulated parts engage and invite the wearer to participate with the jewelry design, creating an interactive experience beyond simply wearing the jewelry. This jewelry is designed to be played with! LTK: What types of materials do you commonly work with?DM: My work is mainly sterling silver with 18k gold accents, pearls, and semi-precious stones. I like the white-white color of sterling (opposed to the yellow-white of white gold), it's malleable nature, and that it can take black patina. Since it is relatively inexpensive (when compared to gold or platinum) my design possibilities can be more experimental. LTK: Which jewelry design techniques do you commonly use? DM: When I get a new idea I try to get a quick sketch down on paper, but many times it evolves. Most of my designs are modular so I work additively. I make the parts, and I start to move things around, re-arrange and add elements until it becomes a finished design. As a result, the design evolves or completely changes; many times it grows into a whole collection of jewelry. LTK: Please describe your jewelry collections. The Abacus Collection is my oldest and my signature collection. It is inspired by the ancient calculator. 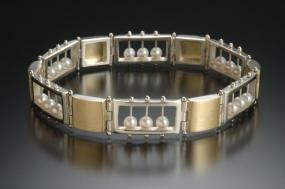 Geometric sterling silver frames house the movable pearls, and 14k gold beads that freely slide along silver wires. The Geometric Collection utilizes timeless geometric forms and repetition of pattern. I incorporate these design elements with polished sterling silver, brushed 18k gold, pearls, and colorful gemstones to create this contemporary yet classical line of jewelry. The Bubble Collection is inspired by natural effervescence. It is based on harmony, balance, and the simple perfection of a circle. 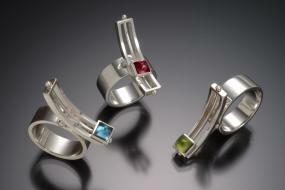 Once again, I use polished sterling silver, brushed 18k gold, pearls, and colorful gemstones to convey this idea. The Mod Collection is inspired by mid-century modern design and the Bauhaus school of design. These designs are based on functionalism and simplicity. The crisp, clean, minimal pieces have kinetic elements integrated into the design, rather than being added to the design. I feel that this adds an unexpected dimension to the jewelry. The Marquise-Vine Collection is inspired by the garden outside my studio and my husband's artwork. Leaves, petals, and vines made in blackened sterling and gold are stripped down to their basic geometric forms and combined with pearls and diamonds. As with many of my collections, I try to incorporate kinetic elements. This collection has swinging leaves. Favorite JewelryLTK: What is your favorite piece of jewelry? DM: One of my all time favorite pieces is my Mod Rocker Ring. It is a kinetic sterling silver ring with the two movements: the top rectangle rocks back & forth like a see-saw while the stone setting freely slides back & forth along a rail. This ring is so fun to fiddle with! LTK: Your husband is also a metal artist. Do you ever collaborate on jewelry projects? DM: My husband, John Benjamin Gilliam (aka Ben), is an amazing metal artist and teacher. He is an invaluable source of support and inspiration. We are constantly bouncing ideas off each other. Normally, we don't collaborate on projects, since I make jewelry and he makes tabletop objects. However, we did collaborate on some jewelry a few years ago. He introduced his signature vine-like forged taper to some of my marquise-shaped elements. The combination of his organic, flowing line and my crisp geometric edges worked well. We are currently collaborating on a set of tableware. The ideas are still in the designing phase, but I am very excited about working together on this new project! Discover Danielle Miller Jewelry by visiting her official website and blog. Customers can purchase her stunning jewelry through her Etsy shop and a select group of galleries and online shops listed on her website. LoveToKnow thanks Danielle for sharing her intriguing jewelry vision.